“You sit over there, ya, next to him. He’s your husband now,” the guide said, deadpan, as he shuffled me into the Lappish hut, the fire blazing so intensely it lit the entire room. I peeled off my thermal suit, the one that made me look like the Michelin Man, and sat beside my new husband. Howling echoed from outside the door. It was Jari. He began to strike the Lappish drum and continued to howl as he approached closer. The door flung open, and Jari revealed himself. He stood costumed in animal skin, a reindeer coat and a fox hat, with black charcoal smudged across his face. Grunting and glaring into the fire, seemingly possessed, I saw immediately that he was a spectacular performer. 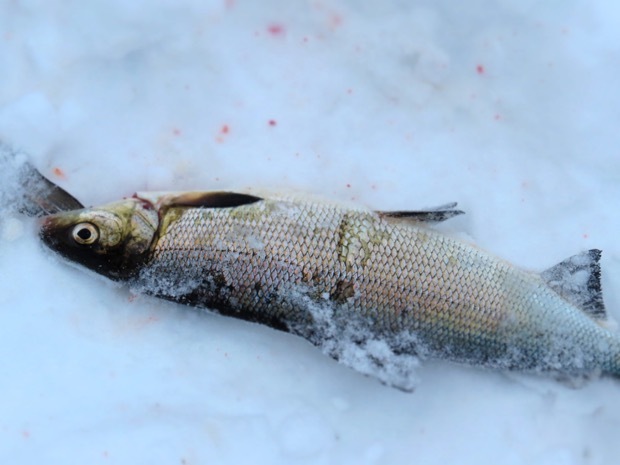 Yesterday, ice fishing on the lake, he was Jari. But tonight, in the tourist filled hut, he was the shaman. I guess I asked for this, I thought. 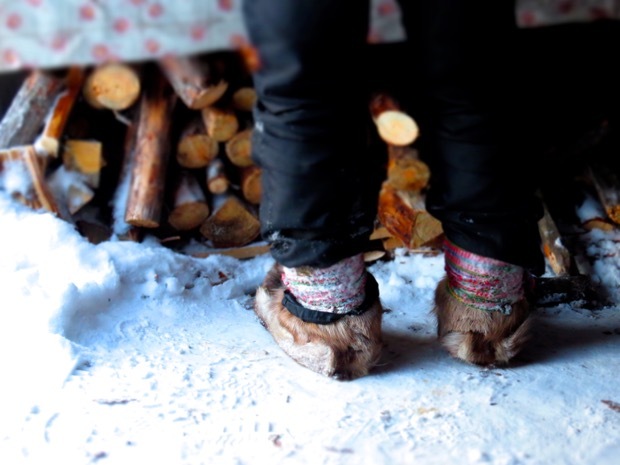 Before arriving in Lapland, I made it my mission to learn about the shamanic traditions of the Sami people. As a typical North American, descending from a mish mash of European ancestry, I’ve never felt particularly connected to my roots. Perhaps this is why I keep searching for pieces of myself in other cultures. In Costa Rica, I chanted Native American songs, sobbed in a sweat lodge, and looked often to my animal totems. In Indonesia I bathed in holy water and prayed under the full moon. On islands in Thailand and beaches in Colombia, I worshiped the sun and the way it painted the sky. 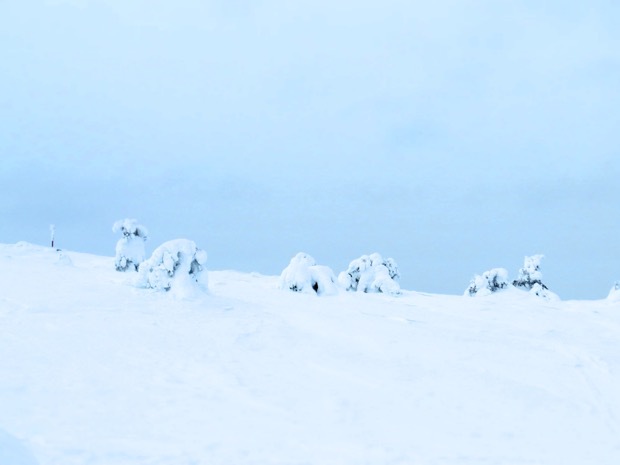 When I began my snowy adventure in Finland, I similarly wanted to practice the ancient forms of healing that came from Lapland. Though to my surprise, I was greeted with much resistance. 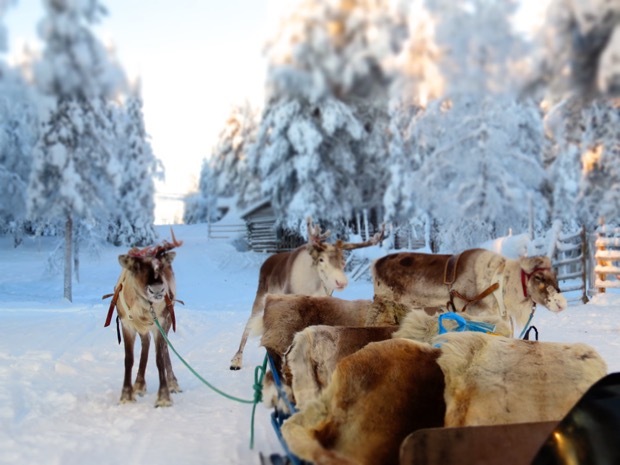 In Salla I saw a glimpse of Sami culture in the eyes of the quiet reindeer herders. In Ruka I sat in a Lappish drum ceremony, a Sami tradition carried out by a modern Finnish woman. 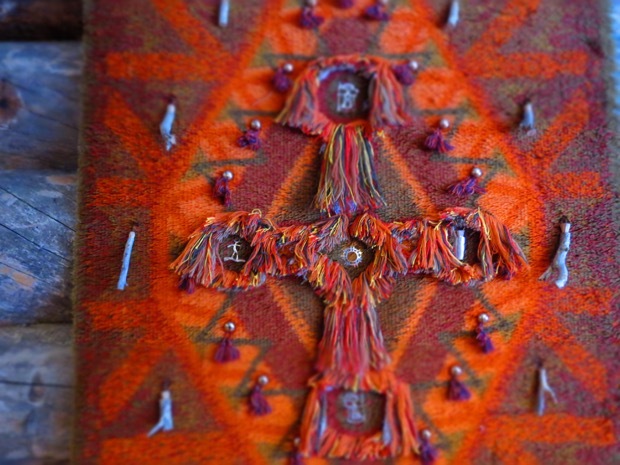 But when I inquired further about the Samis and shamanic traditions, few people seemed to know much. 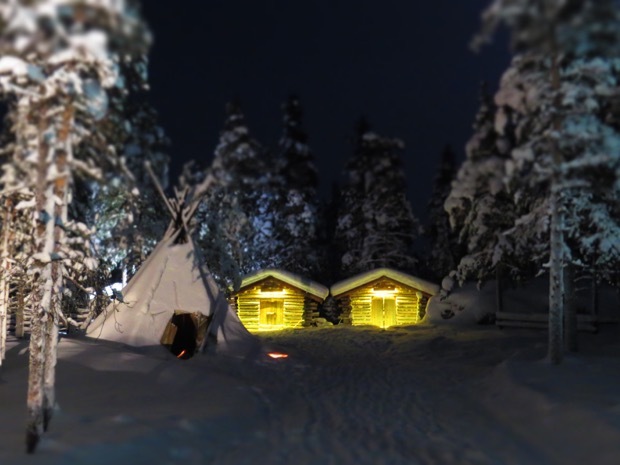 “The best place to learn about the Samis is Inari, you’ll find out more there,” I heard again and again. 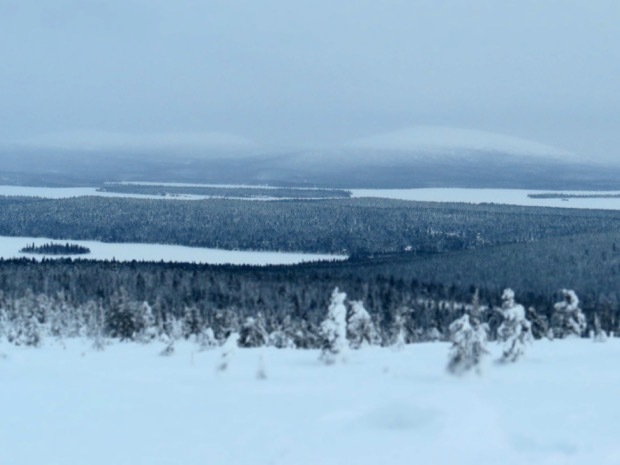 A few days later, a fellow travel writer working with the Inari tourism board, told me that the coordinator was offended that I suggested Samis still lived so “primitively.” In Inari, the place meant to retain more Sami traditions than anywhere else in Finland, it seemed the ancient Sami practices had been rejected. Sensing that Inari may not lead to the answers I sought, I let go of my plans and allowed fate to lead me instead. 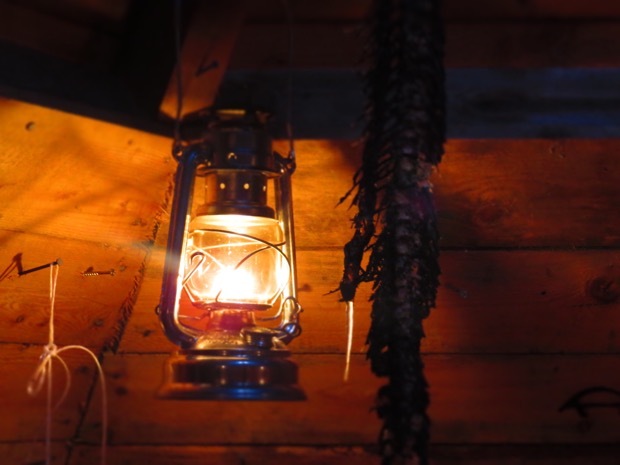 When I did, I found myself in a 200-year-old guesthouse, Sarkijarven Majat, in Muonio. 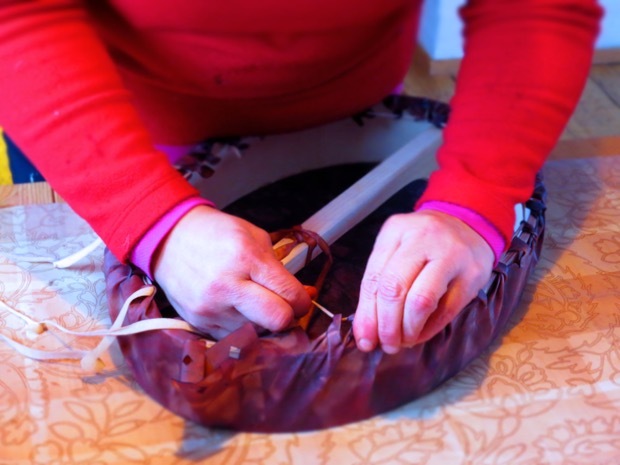 My morning began sitting on the floor beside the fireplace, built by the owner Darja’s ancestors, cutting a piece of reindeer hide for a Lappish drum. “The drum always does what it wants,” Darja laughed. We crumpled the pieces of hide and soaked them in buckets of warm water. 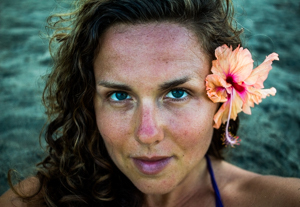 As we waited, Darja told me about a time in her life when she too needed healing. She passed me the bucket of deep currant dye. I held my soggy bungle of reindeer skin in my hands, and infused it with my intentions, before submerging it into the dark bath. We walked over to the dining room to have lunch while I let my skin soak. On the walls of the restaurant hung blown up black and white photos of Darja’s family. She pointed to a photo of a beautiful woman laughing inside of a canoe. 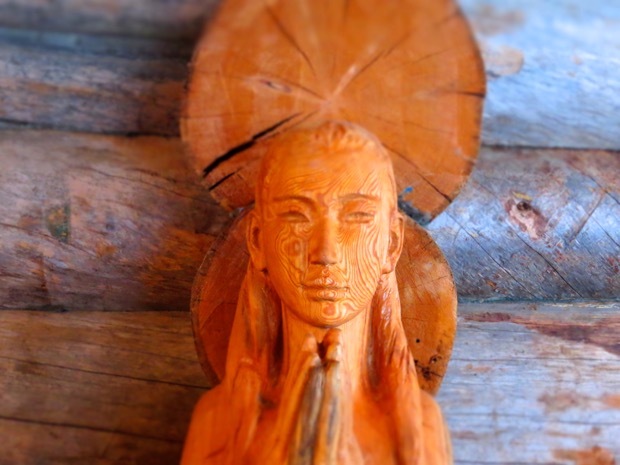 Researcher Francis Joy from the University of Lapland, who studies ancient shamanism within the modern fabric of Finland, states that the indigenous form of shamanism has gone mostly underground in response to religious conversion and cultural upheaval that began in the Colonial Era. 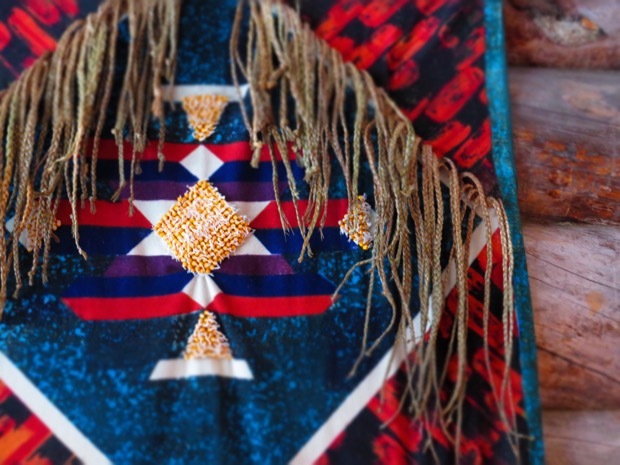 Joy suggests there’s a significant research gap in the practice of shamanism amongst the Sami in Finland, and has dedicated his studies towards uncovering it through examining Sami art throughout history. Art, Joy believes, is how the Samis have managed to continue their stories under the radar. I looked across the dining room at the giant painting Darja hung high in the rafters. She followed my gaze. After lunch we returned to the drums. 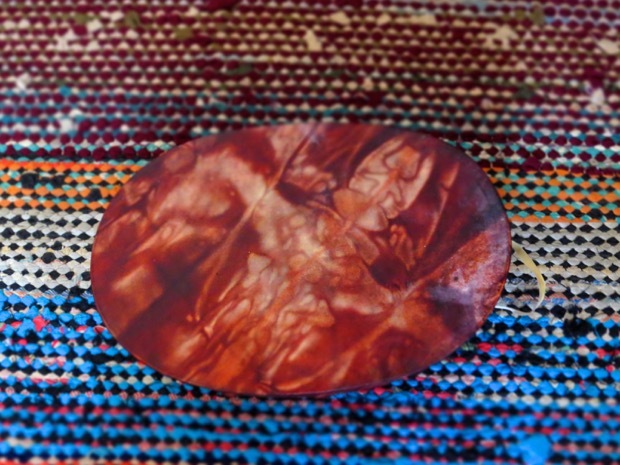 Darja pulled mine out of the dye, rinsed it, and revealed its pattern. 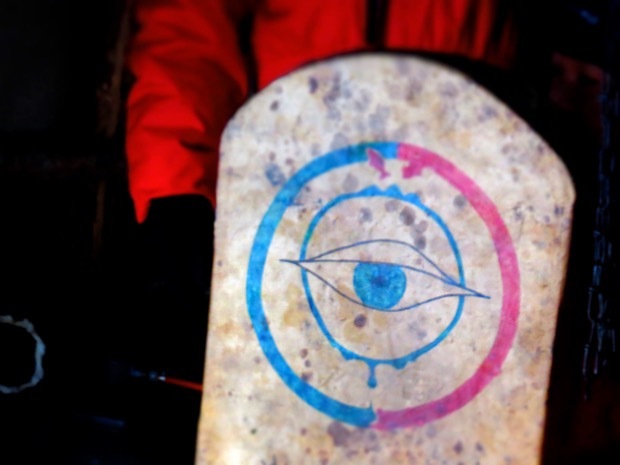 The drum seemed to represent a “practical” device for Samis that could be secretively interpreted on a spiritual level. Darja saw animals, but I saw a skeleton. To me it looked like an x-ray of a human spine. 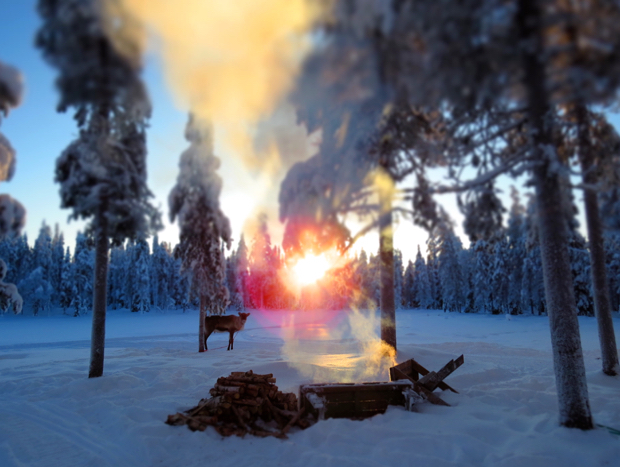 According to Finnish Sami folklore, pieces of the soul are contained within the human bones. Because bones last beyond other organs, the soul itself remains woven deeply in their matter. Of all the bones in the human body, the spinal column is considered the most important. I suppose it’s much like our own American analogy of strength of one’s self being compared to the strength of one’s spine. What message was the artwork in this drum trying to deliver to me, I wondered. 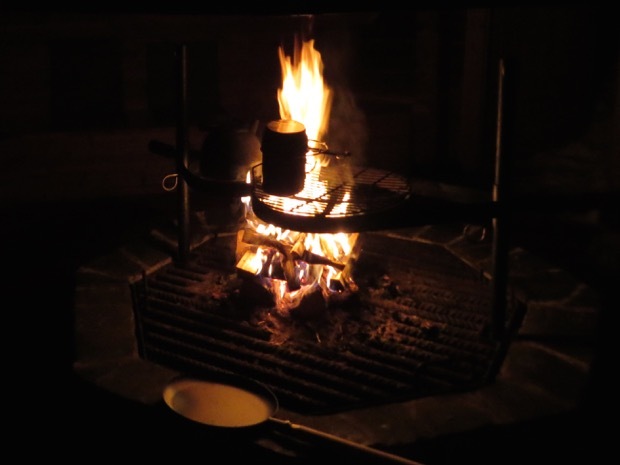 In the evening I met Darja in the fireside room attached to her wooden sauna facing the lake. She was already naked, stoking the fire and dripping with sweat. I stripped off my layers, rinsed off in the shower, and joined her. Her eyes filled with tears and I sat with her, listening, silently lending my support. A practice I’ve learned that can be much more helpful than speaking. The next morning I reluctantly bid Darja farewell as I continued on with my journey. There was so much more I wanted to learn from her. As I left to meet the shaman, I couldn’t help but feel like I had already found one. I was picked up by a news reporter, who wrote for the local paper in Muonio. He drove me to the Jerisjarvi to meet Jari, a local hunting and fishing guide, for ice fishing. The following evening I would see Jari in a very different role, as the shaman. 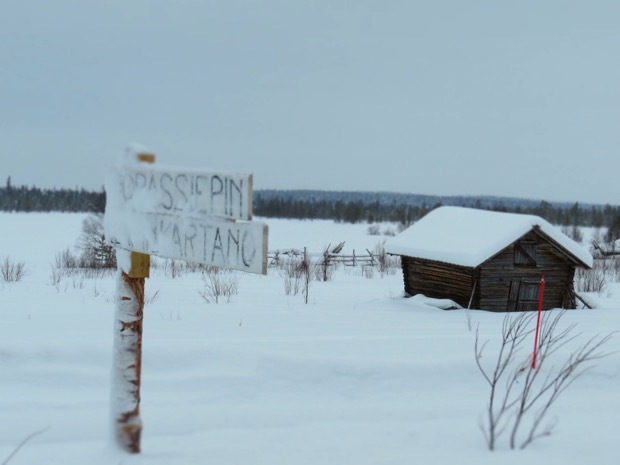 “For the tourists, especially the French ones, meeting a shaman in Lapland is like meeting Santa Claus. A character,” the reporter said. I asked him if he met a shaman before. The forest thinned and an expansive lake came into a view. Just by the roadside the ice had melted and the exposed water was covered in about a dozen swans. “I’ve never seen something like this before,” the reporter said. We pulled over to take photos. 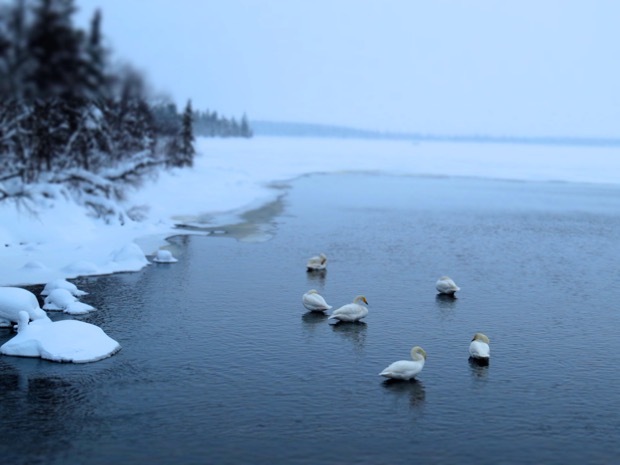 Typically all of the swans fly South for the winter, but something kept these swans North. Seeing them reminded me that even in the dead of winter, there always lives the promise of the Spring. We pulled up to Jari’s house and his hunting dog, Winsky, rushed to the car window. He bellowed and jumped in excitement when I got out. I ruffled his fur and blew him kisses. My eyes shifted to Jari. Tall and handsome, clad in Goretex snow pants and a fur hat, he looked like he stepped out of a Nordic lifestyle magazine. His presence was so strong, I felt taken care of just by standing near him. He hadn’t even spoken yet and I would have trusted him with my life. He spoke with the confidence of Zeus, the warmth of Santa Claus, and the simplicity of a cave man. Out on the lake I turned a heavy metal corkscrew into the ice while Jari prepared the net for fishing. I nodded along while he explained the fishing process. Admittedly I remember little of the technique. 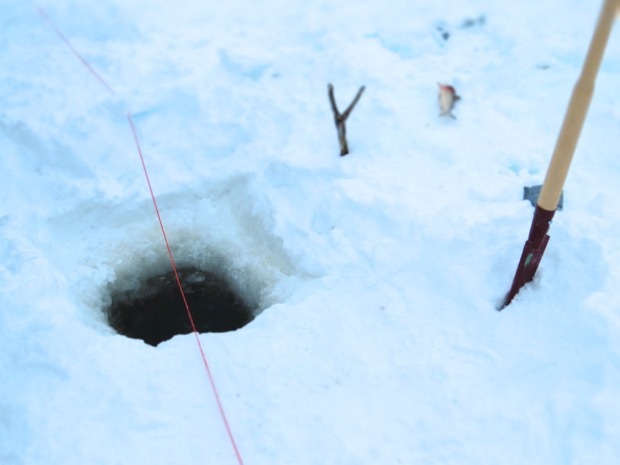 We kneeled beside the ice hole, and began to slowly pull out the net that fed from another hole about fifty feet away. I secretly hoped we wouldn’t catch any fish. Somehow I felt less guilty eating a seared fillet in a restaurant than I did killing one myself. Yet one appeared, a whitefish, flopping about in the net. I couldn’t do it, so Jari did. I looked away while he quickly slit its throat. Winsky quickly rushed over and lapped up the blood. Amazingly, he didn’t touch the fish. He knew it was for us. I knew he was right. Still, the Seattle born, kale smoothie drinking, Costa Rica hippie yoga teacher within me, felt cruel. We caught another, and again Jari slit the throat instantly. 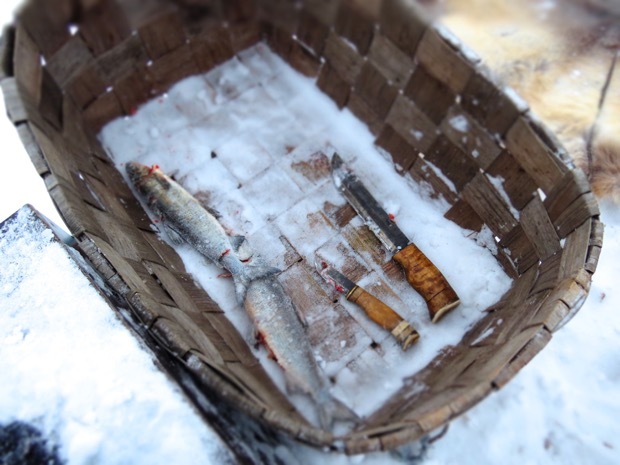 Winsky licked off the blood, and Jari scaled the fish with a knife he made himself. 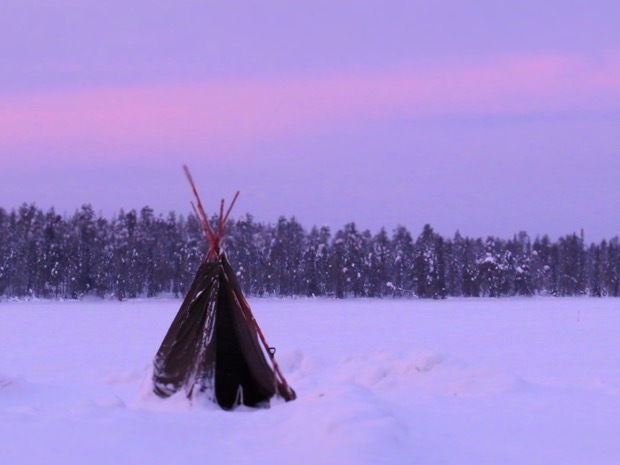 Afterwards we walked back to Jari’s small Lappish hut that faced the lake and built a fire. 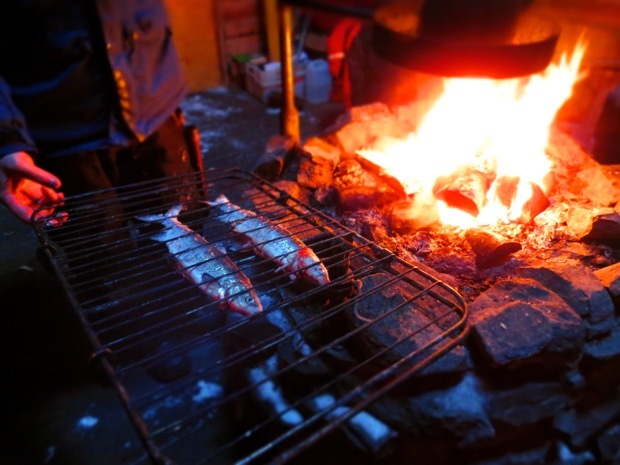 Jari placed the fish on the grill and we waited as they sizzled. I asked Jari how he came to be a shaman. 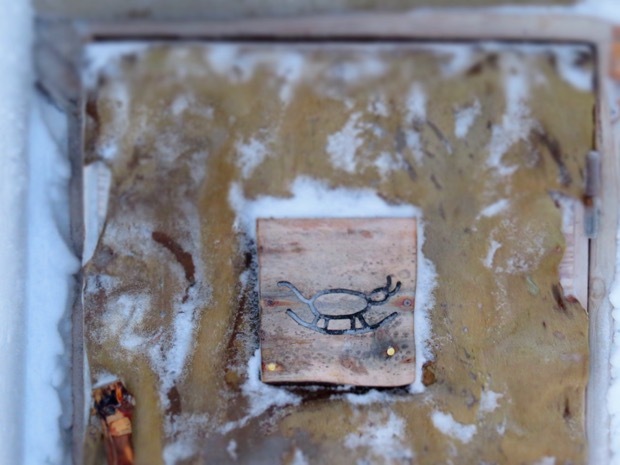 I looked around the hut and noticed the Sami animal symbols Jari painted on the walls. They reminded me of something I read about rock paintings, how they were used by ancient Samis to communicate the best ways to hunt and fish. 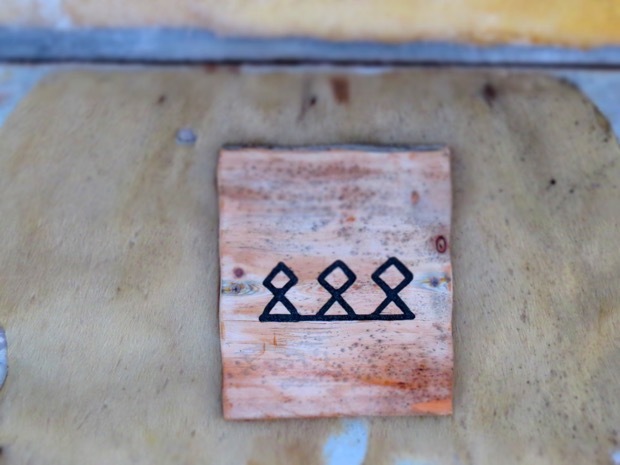 Perhaps these symbols were also drawn somewhere inside of Jari. I asked myself this again the following night, as Jari combed my hair with the claw of a raven, inside of the Lappish hut filled with French tourists. “Ahhhh American womaaannnnn,” he grunted and marked my forehead with charcoal. They giggled, and we looked at one another, sharing our secret understanding. When Jari finished his performance as the shaman, he returned to the kitchen of the main house, where the French tourists would sleep that night. I waited a few beats and followed. 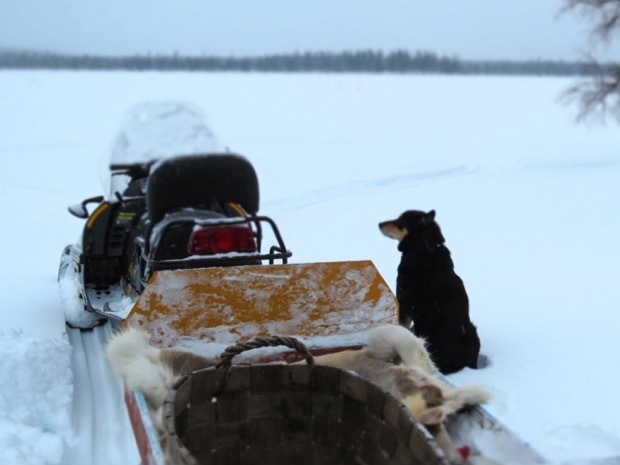 He had already taken off his fox skin hat when I arrived, and was drinking beer and eating cookies with the snowmobile tour guides. They offered me a beer, but I was desperate for water. Jari passed me a small glass, which I drank in an instant. I asked where I could find more. They pointed to what looked like a large garbage can. I peered in and saw water. “You got the water from there?” I asked skeptically. “Yes, it’s water from lake. Very clean,” he smiled. I scooped out the water and sipped this time. It was easily the best water I’ve ever tasted. Crisp yet delicate, the perfect temperature, and completely pure. They all laughed and nodded. I spent the next hour listening to their hunting stories and looking at pictures of dead birds, fish, and reindeer on their mobile phones. They showed them with the pride of a grandmother sharing photos of her first grandchild. Come to think of it, I had no idea what Jari’s family looked like. Instead I had many mental images of his dog and the fish he caught. 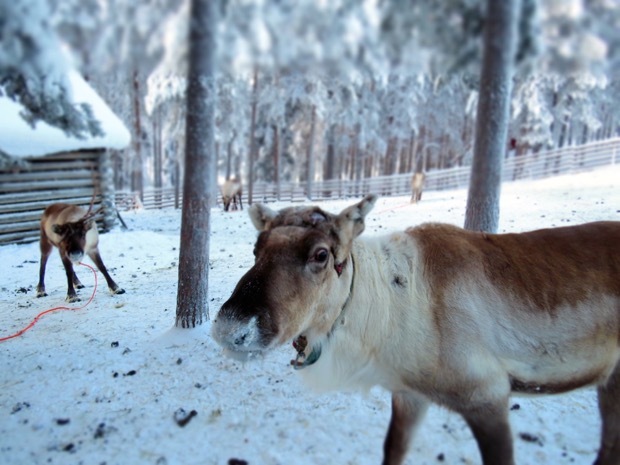 I knew nothing at all about the man next to him, but I had seen about fifty photos of his reindeer. 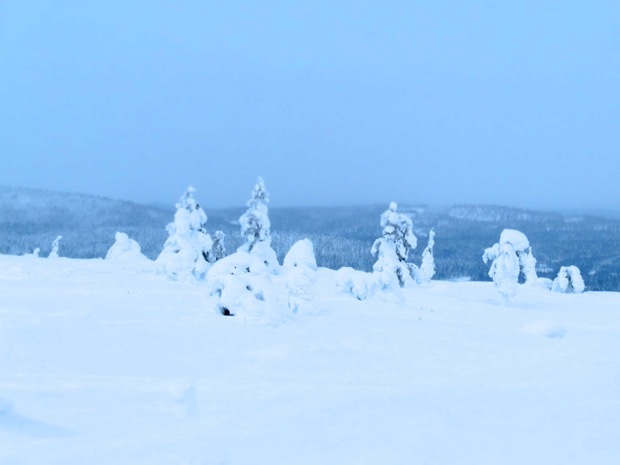 Oddly, it was one of the best experiences I had in two weeks in Lapland. 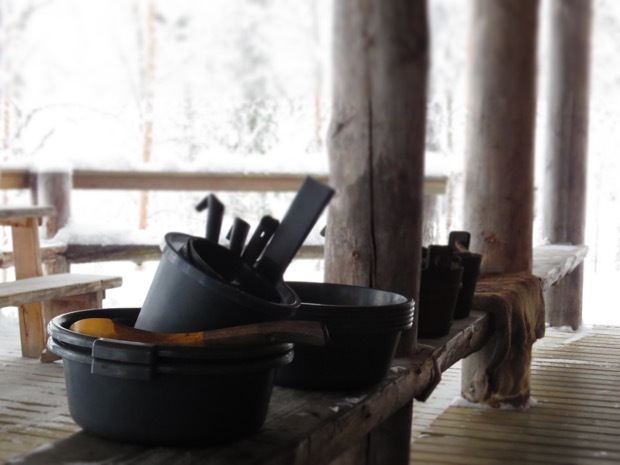 It was interesting to me, how much effort it took to create the experience for the tourists, still inside of the Lappish hut, when to me, the real show was happening right there in the kitchen. I couldn’t have imagined anything more entertaining. I couldn’t have imagined anything more special. Then it hit me. What made it special had nothing to do with effort. It was that they allowed me to be there. 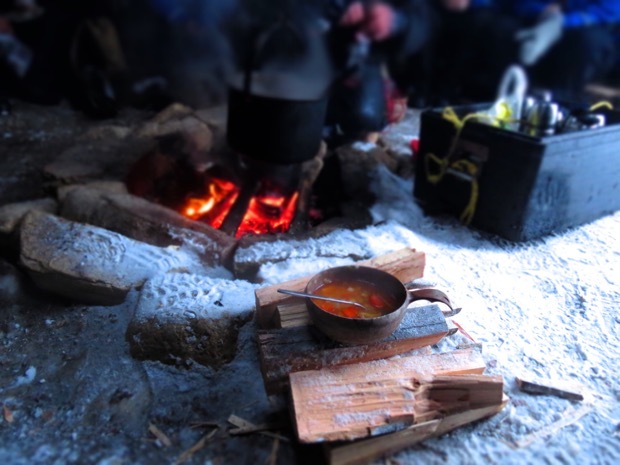 The Lappish hut was their stage, but the kitchen was their sanctuary. 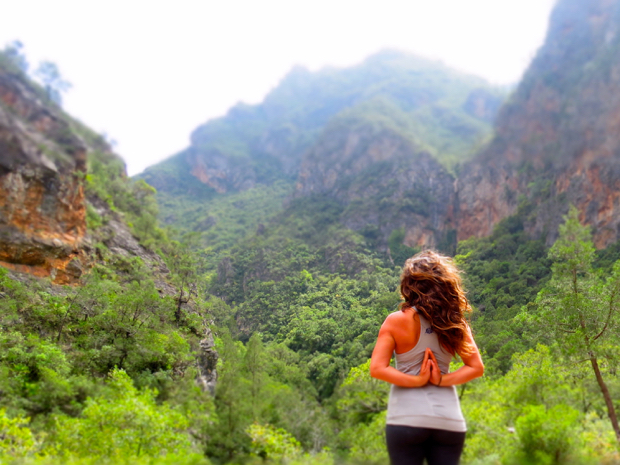 They invited me into their sacred space and treated me as an insider. 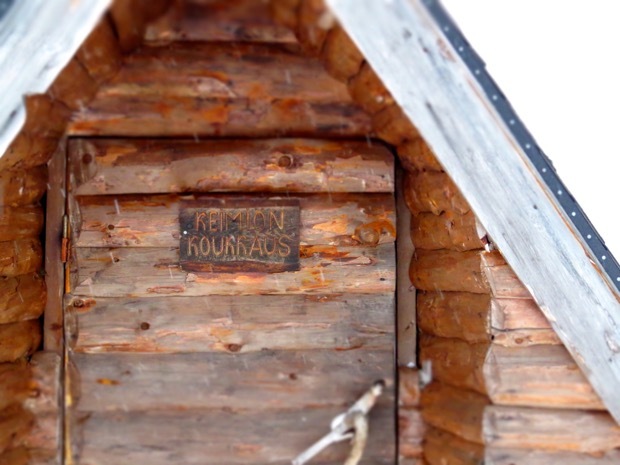 I realized that was the case in every experience that really touched me in Lapland. It never came from research or effort or inquiry. It came from an invitation. The same way Darja had invited me into her home and into her sauna. 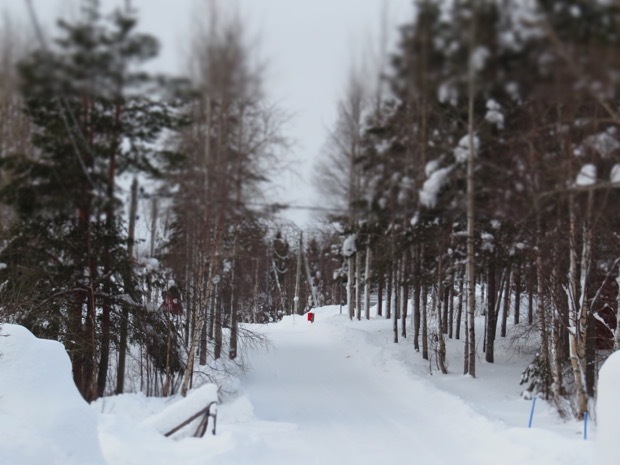 The same way so many people in Lapland had invited me into their world and shown me their soul. Those were not experiences I could seek, those were experiences gifted to me. Upon further reflection, I wondered if perhaps it wasn’t in fact a national rejection of Sami culture that made it so elusive. Perhaps it was its sacredness. 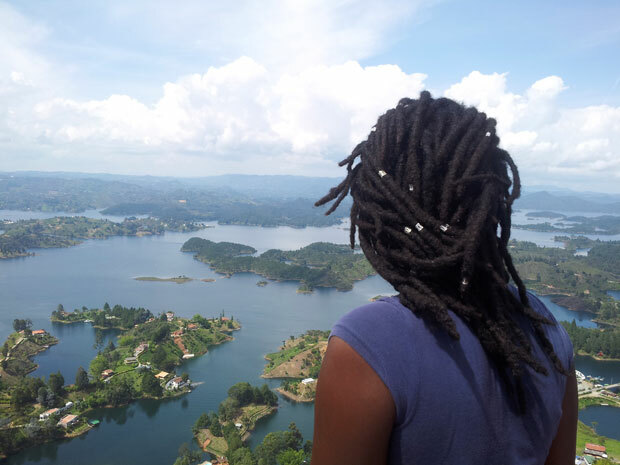 Perhaps it was so sacred, that a tourist who barely knew the culture and the country wasn’t yet entitled to experience it. She must first be invited. At that moment I remembered that whether I discovered ancient wisdom among the Samis or not didn’t even matter. What mattered was that ancient wisdom existed. It existed in nature. It existed at the source. 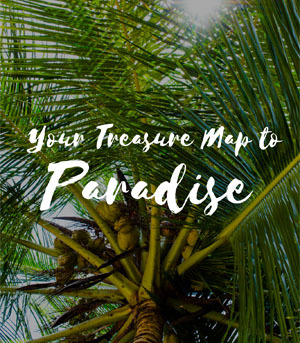 The one place that is always at all of our fingertips. We just have to be open to it. When Jari brought me home that night, I took a walk in the darkness over to the lake. I sat with the ancient wisdom that may not have a song or a story or a symbol, but no matter. There it was. It lived in the sky, in the hills, and in every snow-covered tree. That great spirit always surrounded me. That great spirit sat ready, with an open invitation, waiting for me. I found myself smiling as I read. Your acceptance and understanding create true joy. Great writing again and of course experience. Your stories, they are so warm and you are aware and conscious about everything there. It leaves an warm? feeling in the heart, that´s why it´s so wonderful to read them. Loved this post so much! I read it in the morning and it’s been on my mind for a while… I study anthropology in school and I think it is really true that all the different traditions of the world are just different creative ways of expressing the same basic truths about the wisdom of nature and the universe. Thanks for sharing as always, brings me back to whats important :)! Charlotte,I really like your post. I wish we all would really see that. Then and maybe then there would be no wars. All the religions and mystics, spiritual authentic traditions ,occultism and so on point also to one Truth. Hopefully some day there will be one humanity. So great blog you have. It is wonderfull and you have wonderfull trip. In the wordl are so many great place and thinks and you have find many. Good luck tp you. Giving or receiving it always comes from the invation. I’m interested in traveling to where the Samis live and meeting shamans, as well. 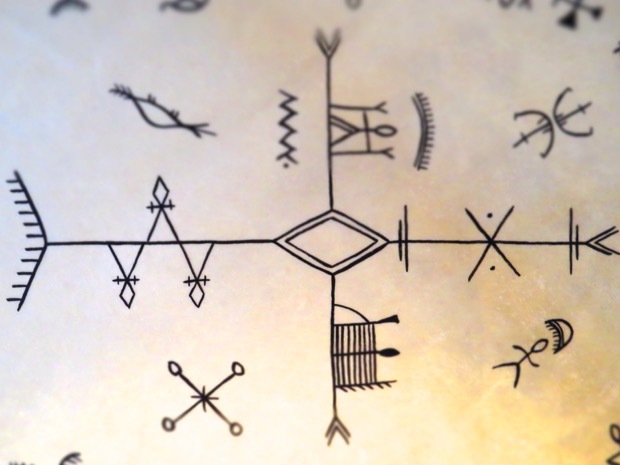 I study shamanism and have Swedish roots. Do you have any suggestions on where to start? 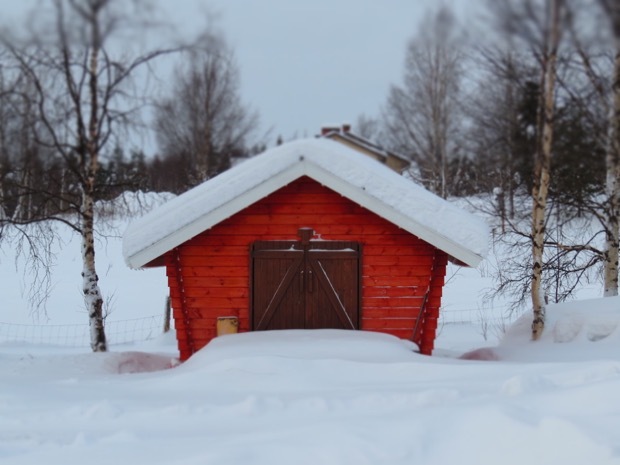 Hey love, check out my post How to Survive Winter in Lapland, lots more info there 🙂 I hope you find all that you are looking for!! Hello! 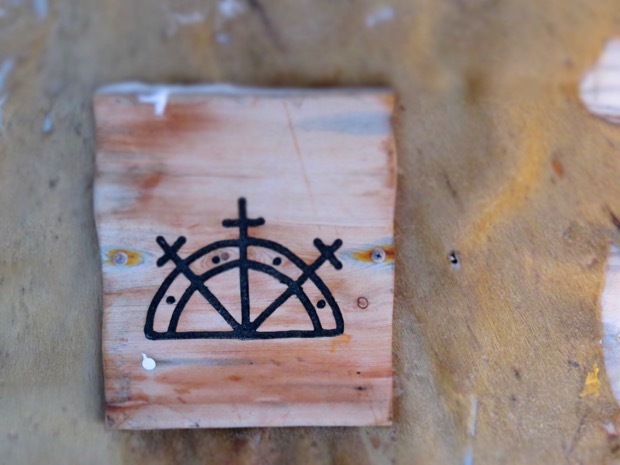 Im traveling in Lapland right now and am also very interested in Saami culture and shamanism. 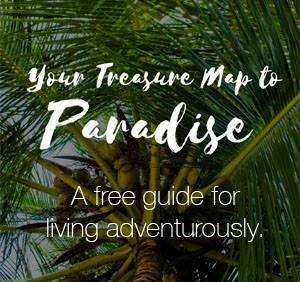 I was wondering if you have any recommendations of places to visit to learn more? Amazing writing style. Thank you! This is such a beautiful story!